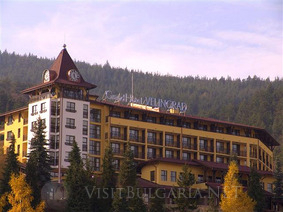 Location: "Velingrad" Grand Hotel is located on a picturesque hill in Chepino Quarter in Velingrad SPA resort. The hotel reveals nice panoramic view towards the town and the beautiful natural landscapes downhill. Accommodation: The hotel offers accommodation in 78 rooms - 8 standard rooms, 54 deluxe rooms, 4 grand deluxe rooms, 4 junior apartments, 3 deluxe apartments and 4 VIP apartment. There is a spacious balcony in each room and suite with a table and chairs. All guests can use the services of 24/7 room service. This SPA hotel offers facilities for disadvantaged people as well. Wine & Dine: The guests of the hotel can enjoy a cozy lobby bar, Vienna cafe, typical Bulgarian restaurant, cigar room and swimming pool bar. The classical restaurant offers Mediterranean cuisine and 150 seats. Its summer garden offers a barbecue. In the traditional Bulgarian restaurant you can taste delicious Bulgarian specialties. The Lobby bar with fireplace seats 32 people and is located in the spacious lobby of the hotel. Here guests can enjoy a rich selection of drinks, exotic cocktails and fresh juices. Piano bar Louis is a night bar with live music. The place is exquisitely furnished and equipped with professional sound and lights accessories. The Pool bar offers a variety of soft drinks and refreshing cocktails. Spa & Wellness: Spa & Wellness centre of the hotel occupies an area of 1 200 sq.m. It is a state-of-the-art place for relax divided into 2 zones: Free access zone – its use is included in the price for your room /apartment. There are 4 swimming pools with mineral water at the hotel. Indoors: half Olympic-size swimming pool (22 m x 10 m) plus children’s one as well as a large Jacuzzi. Outdoors: hot winter swimming pool and hot summer swimming pool. The SPA centre offers: Hamam, Rasoul, massage baths, Cleopatra baths, Saunas - Biosauna and Finnish Sauna, Aroma steam bath, hot lounges, Volcano room, Action showers, body and face therapies as well as special therapies for men. Bowling: The bowling hall of the hotel offers 6 lines and a bar next to them. Conferences: "Velingrad" Grand Hotel offers 3 conference rooms - Bulgaria Hall /up to 200 seats/, Rodophi Hall /up to 60 seats/ and VIP conference Hall /up to 16 seats/. They are appropriate for the conducting of seminars, work meetings and training programs.